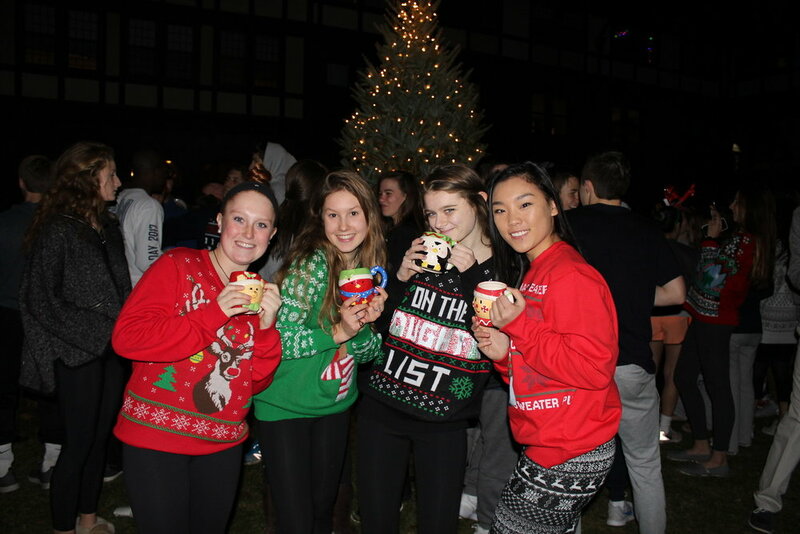 On the first Friday back from Thanksgiving break, St. Markers joined together for the House Cup Holiday Songfest, also known as Deck the Halls, followed by the Christmas tree lighting. The SM jazz bands opened up Deck the Halls with renditions of “Blue Christmas” and “Charlie Brown Christmas.” They were followed by Maple and Pine-Oak with original takes of holiday classics. Gaccon, Marr-Coolidge, Thayer, Sawyer, Coe, and Theriot-North also showed their holiday spirit with performances that included spirited costumes and live instrumental accompaniment. After the songfest wrapped up, the community moved outside to the VI form quad. Below is a video taken via drone of students enjoying the tree lighting. The video was provided by Funny Movie Corporation, a group that has been increasingly involved on campus this year.